Reader mail: Do I need to replace my MacBook battery? Nadine writes: I have a Macbook Air I bought at the end of 2013. I find lately that when I’m using it on battery just to do normal chores and not streaming, the battery dies very quickly. Is it time to get a new battery? How much do they cost? Hi Nadine! I feel your pain. I have a MacBook Air from 2012, and without its power cable plugged in, my Air only seems to run for about an hour before its battery dies. So, what’s the deal? Does your four-year-old MacBook Air need to be replaced—and if so, how much money are we talking here? 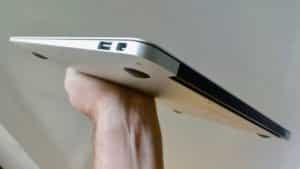 Or is it still possible to wring a little life out of your MacBook’s dwindling battery? The lithium-ion batteries in laptops like your MacBook lose their capacity over time, with Apple estimating that MacBooks should keep about 80 percent of their battery capacity after 1,000 charges. Assuming you give your MacBook Air a full charge each day, 1,000 chargers comes out to about two years and nine months. After that, you can expect your MacBook’s battery to get weaker and weaker. The MacBook Air’s sleek, sealed case sure looks great, but it also means you can’t replace the battery yourself. Beyond the time factor, there’s also the demands that MacOS software updates put on older MacBook batteries. With each major update comes new and potentially power-hungry features, and a few updates down the road, a MacBook battery that once gave you three hours of battery life might eventually give you fewer than two. If the battery in your aging MacBook Air barely makes it past breakfast, you’ve got a couple of options. Because most modern MacBook models, including the Air, feature cases that are sealed completely shut, you can’t replace your MacBook battery by yourself. Don’t want to cough up the cash to replace your MacBook battery? Read on for a few tips that’ll help squeeze more life out of the MacBook battery you’ve got. Probably the number-one battery hog on your MacBook Air is the backlighting on the display. 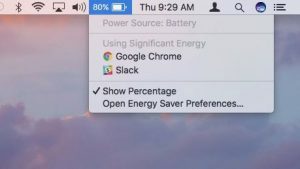 When you’re on battery power, turn the screen brightness down as low as your eyes can stand; doing so will make a huge difference in your MacBook’s battery life. Click your MacBook’s battery meter for a list of apps using a “significant” amount of battery power. Also, you can set your MacBook’s screen to dim itself automatically when you’re on battery power; just open System Preferences from the Apple menu, click Energy Saver, click the Battery tab, then enable the “Slightly dim the display while on battery power” option. Your MacBook can tell you if any of your running programs are gobbling up more power than they should be. Click the battery life indicator in the top-right corner of the screen to find out which apps (if any) are using “significant” power, and quit them if you can. 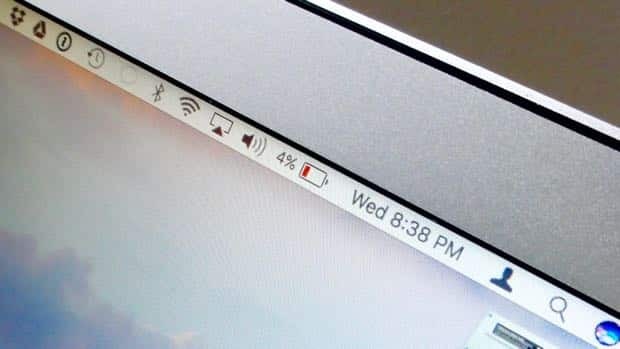 Your MacBook’s USB port can power and/or charge devices like an iPhone or an external hard drive, but doing to puts tremendous strain on your MacBook’s battery. Unless your MacBook is connected to a power source, don’t plug in your iPhone or any other peripherals if you can avoid it. Reader mail: Is now a good time to buy a new MacBook?